Anyway, so I looked and I couldn't find any challenges like this one. So I thought "Hey! Why don't I challenge people to read every one of his books and promote my blog?" And thus, this challenge was born. 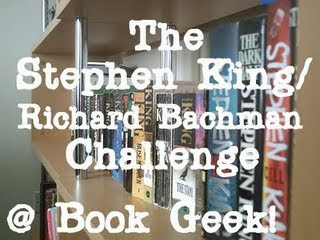 The object of this perpetual challenge is to read EVERY SINGLE book by Stephen King or his pseudonym, Richard Bachman. A complete list can be found here. If you have trouble finding the limited edition books, that's okay. ALSO: If you don't want to, you don't have to re-read the books you have already read. ALSO ALSO: If you want to watch all the movies, too, go ahead. I won't stop you. ALSO ALSO ALSO: Go ahead and review all of the books, too, if you want! There are no time limits. Take as loooooong as you want with this challenge... just sign up with Mr. Linky below! I have read many of King's books, but many have been pre-blog. Hopefully, I will get around to re-reading and reviewing. In the meantime, I have posted an asterik next to those books that I have read, but not yet reviewed. For those that have been reviewed, I have included the link. On to the list. . . .
"Richard Bachman" is a pseudonym that King used until Bachman's true identity was discovered by fans, after which he only published one more Bachman novel. Additional Short Stories: I'm also including the following because they have been short stories that I have read via magazines.